On my way back from work I snapped the crescent moon, Venus and Jupiter. Anyway, I didn’t go out fishing over the weekend so I cold-smoked some salmon I bought at my local supermarket (it is not particularly high quality, but answers pretty well). It came out better than my last batch as I reduced the brining time, as a high-salt cure is not needed at this time of year (being so cold). Whilst it is perfectly tasty when sliced thin and eaten with onions, capers and squeezed lemon, or stirred into hot pasta, or tossed in a salad, I set half the fish aside to make a coarse-textured smoked salmon paté with cream cheese, black pepper and herbs. The photo doesn’t do it justice but it is quite delicious on bread, toast, crackers or even baked potatoes. Also I finished lacquering a ballpoint pen and a new pair of chopsticks. The latter didn’t quite come out as I had hoped but the pen came out a rich, deep sheen with a very smooth finish. The original wood is called keyaki in Japanese (Zelkova) and has a nice grain that picked up the lacquer quite well. Like most lacquer it looks best in natural light, unlike this photo, and in a couple of years will look even better. Well after last week’s fishing ended without hirame (but with a tasty fish anyway in the bag) I decided to call on Captain Yutaka of Nakaminato. I always have a good time fishing on his boat, the 5-ton Yutaka-maru, and since now is the season for hirame I rang him to book myself in for Sunday. The right true gochujang, from Korea. According to the lid, this gochujang is ranked 5/5 in chilli heat – hot by Korean standards is certainly hot – and it has a most satisfying burn. Indeed, I think it should be prescribed for colds. This was brought for me from Korea, but if anyone reading this knows where I can buy this in Japan – or even can read the name of the brand on the lid – please let me know. As the eclipse progressed, the skies cleared remarkably giving great views of the Moon. Indeed, with the event coinciding with closing time of a lot of the bars and restaurants in my neighbourhood, about 11pm, there was more than one group of moonstruck drunkards gazing skywards and shouting at each other in the street. Low overhead clouds miraculously parted in time to reveal all of the eclipse (this year I missed both the last eclipse and the Pleiades meteor events thanks to rain or typhoon). Whilst for obvious reasons I do not like to spend too much time on my balcony looking about with a spyglass and camera, I watched most of it. 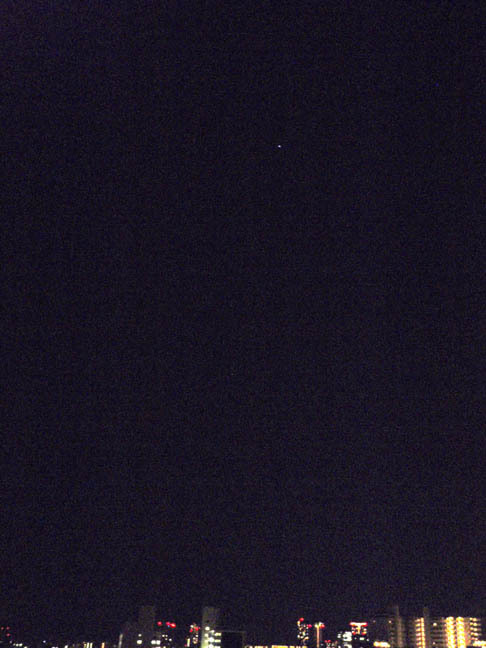 The Moon is in Taurus and you can even see Aldebaran in the photo. Snapped with my point-and-shoot Olympus from my balcony so whilst hardly observatory-quality, you can still see the important stuff: the curious red hue, the Seas &c. There will not be another total lunar eclipse for several years, so it was gratifying to catch this one. to dry out some bamboo on my balcony: three varieties in various stages of drying. The hoteichiku in the fore is probably ready to be used to make rods this winter. The more greenish stuff is yadake that wants at least another year of drying. In the background in the blue net are my liberated ginkgo nuts. As an aside, the 7x waterproof spyglass (monocular) I ordered arrived last night. Whilst for obvious reasons I try not to look through it out on my balcony too often, in the evening I could spot at least one Jovian moon (looking at charts later it was probably Callisto) with it, not bad for a little 7×28 device which I bought mostly for its rugged and waterproof nature to take when I go fishing. I look forward to putting it to good use on the water in the future. It doesn’t come out in the photo but I assure you the star was a quite striking blue; hardly surprising the natives here refer to Sirius as aoboshi. Later in the evening most of the Orion constellation was visible, and also most gratifying for anyone interested in the sea, Castor and Pollux. The strong winds and clear skies continued the following day, and at about 2:30am I was treated to a view of Saturn, which means of the planets in our solar system most easily remarked by naked eye just Mars and Mercury remain to complete the whole shooting-match (with my limited understanding, I will be able to make observations of these planets in the next couple of months). It has been most gratifying to list all the stars and constellations I have managed to pick out, with just my glims and an online astronomical chart, in spite of being in such a light-polluted place as inner Tokyo, and being continually confounded by my balcony overlooking the easterly air approach to Haneda. Perhaps a visit to the inaka – with a glass, thermal underwear, Thermos filled with boiling hot coffee double-shotted with rum, and concluded with a soak in an onsen – is in order. 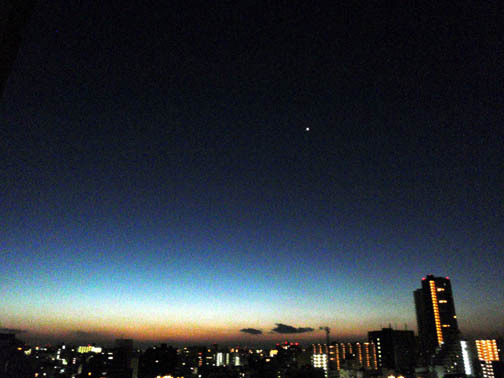 Venus rising over Tokyo; early this morning.